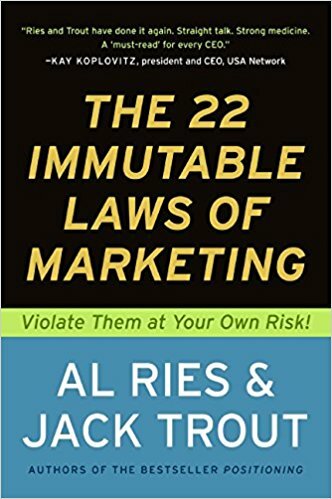 The quintessential marketing book. Always worth referring back to. Yet to be outdone in its straightforward usefulness. It’s much easier to get into the mind first than to try to convince someone you have a better product than the one that did get there first. One reason the first brand tends to maintain its leadership is that the name often becomes generic. Xerox, the first plain-paper copier, became the name for all plain-paper copiers. People will stand in front of a Ricoh or a Sharp or a Kodak machine and say, “How do I make a Xerox copy?” They will ask for the Kleenex when the box clearly says Scott. They will offer you a Coke when all they have is Pepsi-Cola. Regardless of reality, people perceive the first product into the mind as superior. Marketing is a battle of perceptions, not products. When you launch a new product, the first question to ask yourself is not “How is this new product better than the competition?” but “First what?” In other words, what category is this new product first in? Everyone’s interested in what’s new. Few people are interested in what’s better. Being first in the mind is everything in marketing. Being first in the marketplace is important only to the extent that it allows you to get in the mind first. The single most wasteful thing you can do in marketing is try to change a mind. All that exists in the world of marketing are perceptions in the minds of the customer or prospect. The perception is the reality. Everything else is an illusion. The essence of marketing is narrowing the focus. You become stronger when you reduce the scope of your operations. You can’t stand for something if you chase after everything. The ladder is a simple, but powerful, analogy that can help you deal with the critical issues in marketing. Before starting any marketing program, ask yourself the following questions: Where are we on the ladder in the prospect’s mind? Much like a wrestler uses his opponent’s strength against him, a company should leverage the leader’s strength into a weakness. Law 10: Over time, a category will divide and become two or more categories. Invariably, the leader in any category is the brand that is not line extended. Take baby food, for example. Gerber has 72 percent of the market, way ahead of Beech-Nut and Heinz, the two line-extended brands. You must find your own word to own. You must seek out another attribute. It’s much better to search for an opposite attribute that will allow you to play off against the leader. The key word here is opposite— similar won’t do. So it may come as a surprise to you that one of the most effective ways to get into a prospect’s mind is to first admit a negative and then twist it into a positive. Most often there is only one place where a competitor is vulnerable. And that place should be the focus of the entire invading force. Implicit in most marketing plans is an assumption about the future. Yet marketing plans based on what will happen in the future are usually wrong. With hundreds of computers and an army of meteorologists, no one can predict the weather three days in advance, so how do you expect to predict your market three years in advance? No one can predict the future with any degree of certainty. Nor should marketing plans try to. Ego is the enemy of successful marketing. Objectivity is what’s needed. Too many companies try to fix things rather than drop things. “Let’s reorganize to save the situation” is their way of life. When things are going well, a company doesn’t need the hype. When you need the hype, it usually means you’re in trouble. Here’s the paradox. If you were faced with a rapidly rising business, with all the characteristics of a fad, the best thing you could do would be to dampen the fad. By dampening the fad, you stretch the fad out and it becomes more like a trend. You’ll get further with a mediocre idea and a million dollars than with a great idea alone.